Our Solstice celebration was marred by a pronounced lack of Mistletoe and Holly; I stopped at 4 different places looking for either/both to absolutely no avail. One florist suggested I purchase something called a "Kissing Ball" which I have never heard of. "Does the Kissing Ball have Mistletoe in it?" I inquired; "Err...no. But I wasn't sure if you wanted actual Mistletoe, or if it;s just the Kissing Factor you are after," was the entirely unsatisfactory reply. I wasn't comfortable telling her, a stranger, that I wanted the Mistletoe and the Holly for what is ostensibly a "pagan" celebration; one never knows here in New England how much to reveal. *sigh* To comfort myself, I thought I should do a little reading on the topic. "The Druids started it. Mistletoe, a hemi-parasitic plant that grows on trees, has long been considered a cure-all with special properties: In the Aeneid, the hero brings a bough thought to be mistletoe—a symbol of vitality that remains green even in winter—to the underworld. But the earliest mention of mistletoe's romantic powers was by Roman natural historian Pliny the Elder, who scoffed at the Druids of the 1st Century A.D. for believing that "mistletoe, taken in drink, will impart fecundity to all animals that are barren." That romantic association was later expanded by the Norse myth about Baldur and his mother, Frigga, the goddess of love and marriage. According to legend, Frigga got all the plants and animals of the Earth to promise not to harm her son—except mistletoe. 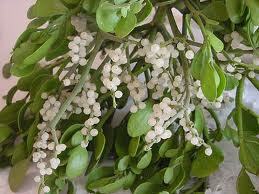 Loki, the god of mischief, took that opportunity to kill Baldur with a spear made of mistletoe. In some versions of the tale, Frigga's tears then turned into mistletoe berries, which brought Baldur back to life, prompting Frigga to declare mistletoe a symbol of love. It wasn't until the 18th or 19th centuries, though, that the British started hanging mistletoe as part of Christmas celebrations. In an 1820 story, Washington Irving described Christmas decorations that included "the mistletoe, with its white berries, hung up, to the imminent peril of all the pretty housemaids..."